As our 41-day transatlantic cruise on The Mariner of the Seas from Galveston to Singapore comes to and end tomorrow, we find ourselves in Malaysia! It’s beautiful and tropical – a virtual paradise of 13 states and three territories, where 29 million people live! And we’re told there are twice as many vehicles! Yesterday, we took a brief excursion from the ship into the City of Penang, where we observed modern architecture mixed with many cultural designs from the past. 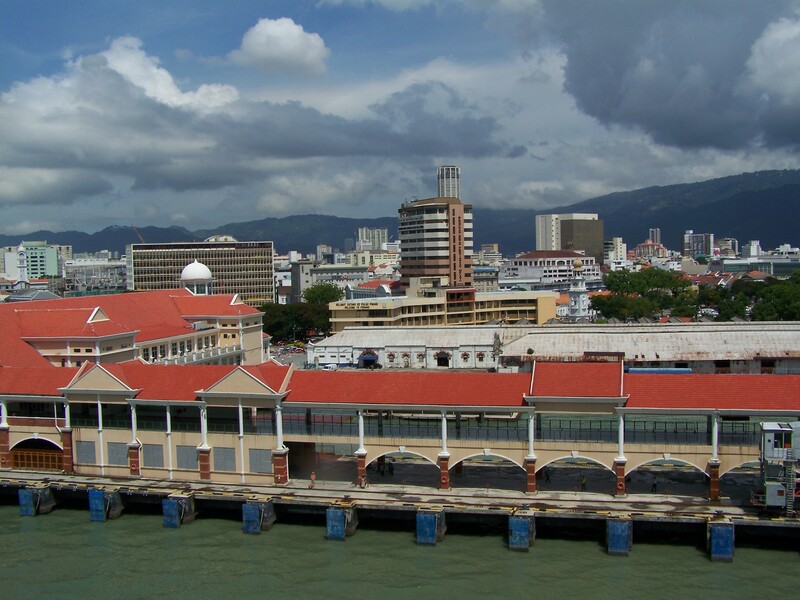 Penang once named Prince of Wales Island by the British, who turned the island into a Crown Colony. With thousands of immigrants with ethnic diversity, it became the “Pearl of the Orient,” and today it is known as a Gourmet Paradise! The people here love to eat and they are famous for their recipes – from Chinese to Thai and Indian. We stopped at Wah Thai Native Products market, where locals buy their white coffee, Bakuteh (herbal pork soup), Chikuteh (herbal chicken soup), nutmeg and clove oils and Tar Sar Phea (green bean biscuit). We bought white coffee, dark chocolate, herbal tea and nutmeg candy! 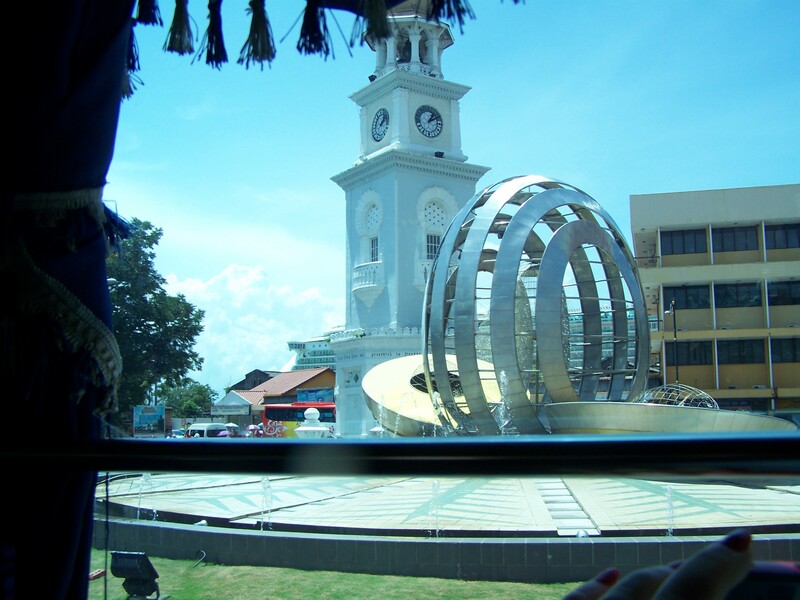 We drove through the capitol and charming, historic district of George Town, a UNESCO World Heritage Site, and visited a local mall, which included a McDonald’s! Our tour took us down Harmony Street, which is appropriately named. Along this street there are many Christian churches, Hindu Temples and Chinese Buddhist Temples, to name a few. Among the Christian churches were Catholic, Baptist, Methodist, Seventh Day Adventists, and a few others that I missed. It is pleasing to know that freedom of religion of all kinds is alive and well here on Harmony Street. And wouldn’t it be nice if that could be said of the rest of the world? By the way, the largest Chinese Buddhist Temple in Malaysia can be found in Penang, better known as the Temple of Ten Thousand Buddhas. And the Thai Buddhist Temple houses the 4th largest reclining Buddha in the world. Although these temples were not on our excursion, I talked to some passengers who visited them and were very impressed! The Mariner of the Seas is docked at Port Klang today, which is not even close to Kuala Lumpur. We had scheduled a 7-hour excursion to KL (KL is what the local call Kuala Lumpur) but we cancelled it in order to get ourselves ready to disembark early tomorrow (Saturday) in Singapore, where we will have the whole day to tour. If possible, I’ll post a blog from the airport about our visit to Singapore. When this trip is over and Wi-Fi is no longer a problem, I plan to post more photos and bits of information from the cruise highlights and ports of call. Thank you for coming along on this journey of a lifetime with me, which is sadly coming to an end. And thank you to my husband who has been a wonderful travel companion and photographer! See you on our final stop in Singapore tomorrow, Saturday, June 1. ← The people are friendly in Cochin, India! Why do you have to be so condescending? to sound surprised when you found a McDonald’s in Malaysia? That was a great insult to me and my fellow Asians. I hope that you feel embarrassed about your point of view.